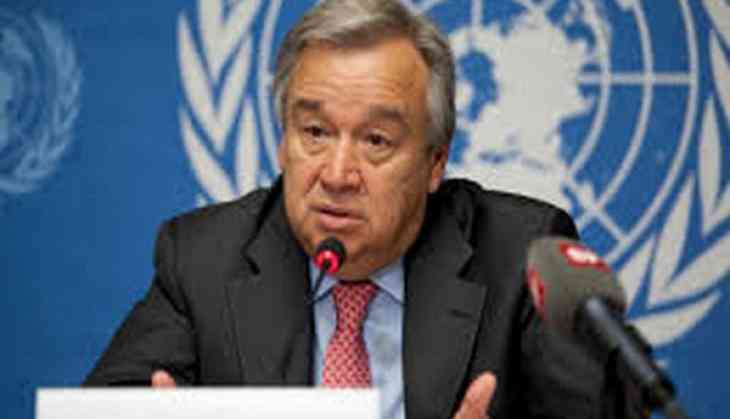 Mahatma Gandhi's message of communal harmony and tolerance remains as relevant as ever, UN Secretary General Antonio Guterres has said ahead of his maiden visit to the country as chief of the world body. His visit from Monday coincides with the beginning of events to celebrate the 150th anniversary of the birth of Mahatma Gandhi on October 2. Guterres said that he is happy his first visit to India coincides with the beginning of celebrations to mark the 150th anniversary of the birth of Gandhi, the "great social, political and spiritual leader of India who is one of the most revered figures in history." He emphasised that Gandhi's message of peace and nonviolence has carried far beyond India, which is why in 2007, the UN General Assembly designated October 2 as International Day of Nonviolence. "In today's turbulent world, Gandhi's message of communal harmony and tolerance remains as relevant as ever. I believe it is crucial that Gandhi's legacy is preserved, and that nations around the world continue to cherish and celebrate their ethnic and religious diversity," Guterres told PTI in an interview. He said India has a special role to play in the global effort for democratisation and the elimination of extreme poverty and hunger around the world, Guterres said. "I am very familiar with the vibrant beauty of India and look forward to seeing more of it," Guterres said. Guterres said he admires India's "incredible transformation" into a global leader in technology. With some 800 million people under the age of 35, he said he believes young Indians are not only shaping India's future but also contributing to the betterment of the entire world. "As the world's largest democracy and as a nation that has lifted millions of its people out of poverty and built one of the world's largest middle classes, India has a special role to play in the global effort for democratisation and the elimination of extreme poverty and hunger around the world, in line with the Sustainable Development Goals," Guterres said. On the first day of his visit to India, Guterres will formally open the new UN House in New Delhi. He will participate in the closing session of the Mahatma Gandhi International Sanitation Convention. He will also meet with the Speaker of the Lok Sabha, Sumitra Mahajan, before giving an address at the India Habitat Centre on Global Affairs on the theme 'Global Challenges, Global Solutions'. In the evening, he will take part in the General Assembly of the International Solar Alliance. He will also meet President Ram Nath Kovind, Prime Minister Narendra Modi and Foreign Minister Sushma Swaraj and visit the Golden Temple in Amritsar on October 3.